The opulent Armenian Opera Theater in the heart of Armenia’s capital Yerevan reverberated with some truly fresh sounds on the evening of February 25, 2012, as two of Armenia’s elite musical ensembles dug into new pieces composed entirely by children from Armenia and the United States. The concert, “A-to-A: A World in Harmony,” featured the Armenian Philharmonic Orchestra and DOGMA, one of the country’s most popular rock bands. The event was co-sponsored by the LUYS Education Foundation and the U.S. Embassy in Yerevan to celebrate the embassy’s 20th anniversary. 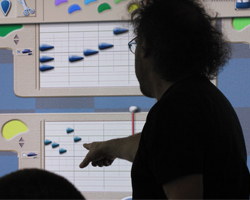 Despite the composers’ youth – they ranged in age from 8 to 14 – their work was rich and rewarding to hear, thanks to the boost their musical imaginations received from Hyperscore, a music-creation software developed at the Massachusetts Institute of Technology’s Media Lab by a team led by renowned composer Tod Machover. Hyperscore puts unprecedented composing power into the hands of people who long to express themselves musically, regardless of their formal training. More than that, Hyperscore turns out to be an exceptional tool for collaborative creativity. One of the pieces receiving its world premiere at the Yerevan event was jointly composed by children in Boston and Armenia. Musical composition is usually imagined to spring from the minds of geniuses toiling in splendid isolation. But for the youngsters visiting the Media Lab earlier in February, the composing process was more like a cyber paintball game. Color-coded splashes of melodies and beats popped up on a large flat-screen monitor as a half-dozen students from the Armenian Sisters’ Academy in Lexington, MA, traded ideas over a Skype connection with their counterparts in a classroom 8,700 kilometers away in Yerevan. Under Machover’s deft direction, the students launched into creating their new piece by humming melodies and tapping out rhythms, which were notated using Hyperscore. The screen quickly filled up with melodic ideas, or ‘motifs’, and a percussion sequence. The kids then started assembling their composition. “Do you want the piece to start with a big explosion, or something quieter?” Machover asked. Something quiet, the kids agreed. A motif was selected and “drawn” onto the digital canvas. A second pensive motif was introduced, and then it was time to bring in some livelier motifs to wake things up. “How do you tell a story through music? How could we keep this moving, keep it building?” Machover urged. The kids started piling on layers, made a motif swing high and swoop low, tried out various harmonic configurations… and they were out of time. In one hour, they had put together the first minute of their piece. After a few more sessions, they completed a short but complex and fascinating work which they titled “Frenzy of Friendship”, ready to be orchestrated and sent to the Armenian Phil for its world premiere.